We can divide space missions into two broad categories. One services other system elements, typically on the user premises, such as Comsat ground stations or GPS navigation receivers. The other category senses elements that are not a part of the mission system, such as the clouds observed by weather satellites. Our first step in defining the system elements (Chap. 9) is to determine the subject's key characteristics. "receiver" to characterize, and the effective isotropic radiated power (EIRP) specification for the transmitter is replaced by definition of the object's emission intensity as a function of bandwidth. Table 2-11 summarizes the characteristics of both types of elements. TABLE 2-11. Summary of Main Characteristics of Space Mission Subjects. See Chap. 13 for definitions of communications parameters. 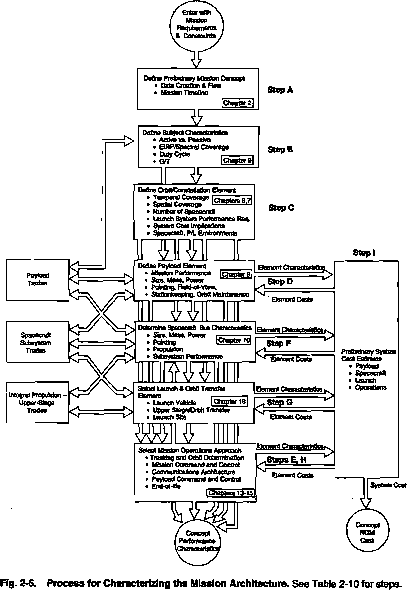 The mission orbit profoundly influences every part of space mission development and operation. Combined with the number of spacecraft, it determines all aspects of space-to-ground and ground-to-space sensor and communication coverage. For the most part, the orbit determines sensor resolution, transmitter power, and data rate. The orbit determines the spacecraft environment and, for military spacecraft, strongly influences survivability. Finally, the orbit determines the size and cost of the launch and delivery system. Chapter 7 gives detailed directions for orbit design. As Table 2-12 shows, the design should include parameters for the mission and transfer orbits, propellant requirements, and constellation characteristics. We next use the subject characteristics from Step 2 and orbit characteristics from Step 3 to create a mission payload concept. We can divide most mission payloads into six broad categories: observation or sensing, communications, navigation, in situ sampling and observations, sample return, and crew life support and transportation. More than 90% of current space-system payloads observe, sense, or communicate. Even the navigation payloads are basically communications payloads with ancillary data processing and stable time-base equipment to provide the navigation signal. Detailed directions for sizing and definition appear in Chap. 9 for observation payloads and in Chap. 13 for communications payloads. Table 2-13 summarizes the key parameters we need to specify. TABLE 2-12. Summary of Orbit and Constellation Characteristics. See text for discussion. TABLE 2-13. Summary of Mlsslon-Payload Characteristics. For multiple payloads, we must determine parameters for each payload. Payload vs. orbit trades typically try to balance the resolution advantages of low altitudes against the fewer spacecraft needed for the same coverage at higher altitudes. The counterbalancing factor is that we need a sensor with a larger aperture and better sensitivity to obtain the same resolution at higher altitudes; the more capable sensor costs more and needs a larger spacecraft and launch system. Payioad vs. spacecraft trades usually try to meet pointing and tracking requirements at the lowest cost At one extreme, the payioad does all the pointing independently of the spacecraft attitude; an example is the use of gimballed scan platforms on the JPL Mariner MK-II spacecraft At die opposite extreme, Space Telescope and Chandra X-Ray Observatory point the entire spacecraft with the required level of accuracy. An intermediate approach used on RME points the entire spacecraft to a lower level of accuracy, allowing the payioad to do fine pointing over a limited field of regard. We next select and size the elements needed to support communications and control of the spacecraft and payioad. Table 2-14 gives the key parameters. Typically a mission operations control center commands and controls the spacecraft and delivers data to the user. With rare exceptions, we would choose an existing control center, based on the user's needs, downlink data rates, and, in some cases, security considerations. 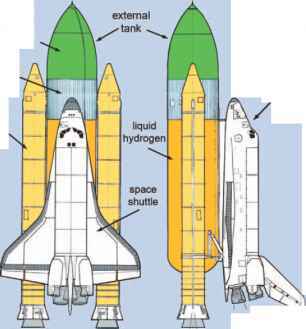 Both NASA and the Air Force have existing systems. Particular institutions, such as Intelsat or Comsat, use custom systems. Most commercial operators employ system-peculiar control centers. If needed, we can interconnect most systems with different options for relaying communications. Chapter 15 details the specification, selection, and design of this element. TABLE 2-14. Summary of Mission Operations Characteristics.